With more than 1,000 LEGO® minifigure stickers, this fun LEGO sticker book is a must-have for young LEGO fans. Meet all your favourite LEGO minifigures in one collection! LEGO Amazing Minifigure Ultimate Sticker Collection is a fantastic sticker book, packed with absorbing caption and over 1,000 easy-peel LEGO stickers, including all sorts of accessories, vehicles and characters. Expect minifigures from popular LEGO series including LEGO City, Castle, Star Wars™, Harry Potter, Lord of the Rings™, LEGO DC Super Heroes, Ninjago, Legends of Chima, Galaxy Squad and LEGO minifigures. A delight for young LEGO fans and budding minifigure collectors, meet ninja and Pharaohs, forest police and monsters, as well as Jedi, Super Heroes, wizards, orcs. 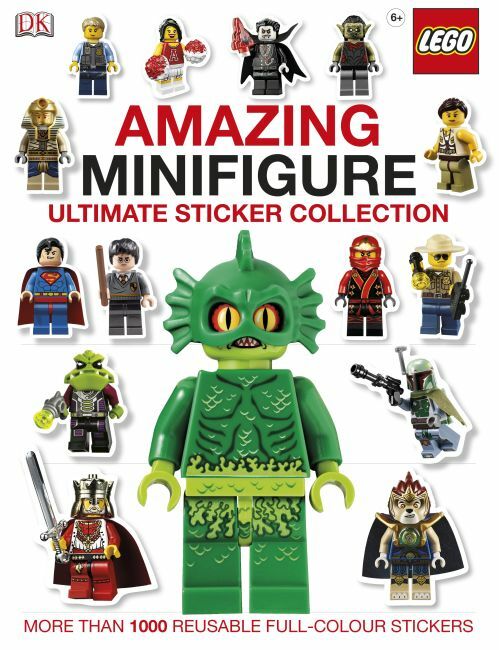 Enjoy the wonderful world of LEGO in LEGO Amazing Minifigure Ultimate Sticker Collection! LEGO, the LEGO logo, the Brick and Knob configurations and the Minifigure are trademarks of the LEGO Group. ©2013 The LEGO Group. All rights reserved.